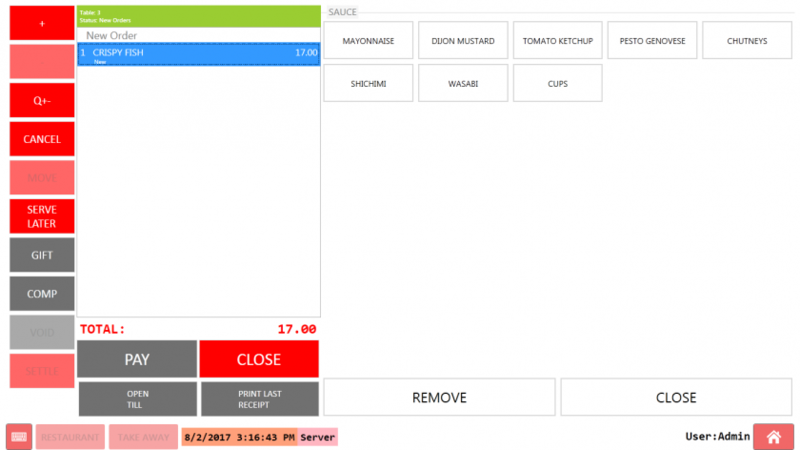 Order Tags are helpful to define modifiers or condiments for menu items. 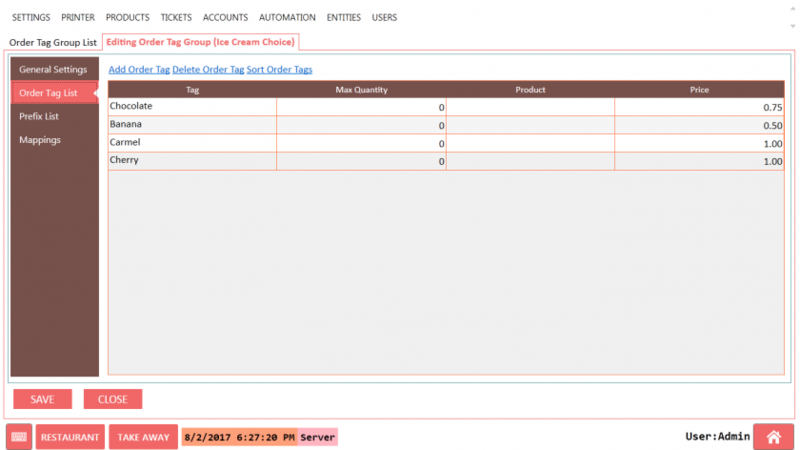 Using DinePlan you can define Order Tags for all the Products or only for a certain group or only for certain products. The following tutorial have explained by sections. Let us start by defining All Products Modifiers. They will work for all products in my menu. STEP 3: Go to Mappings and click Add Link and as below. It’ll leave everything as * (star) because I want to use them for all products. Note: Once the above the steps are completed, please restart the application to see in effect. You can select any modifier from the left side and also de-select as well. 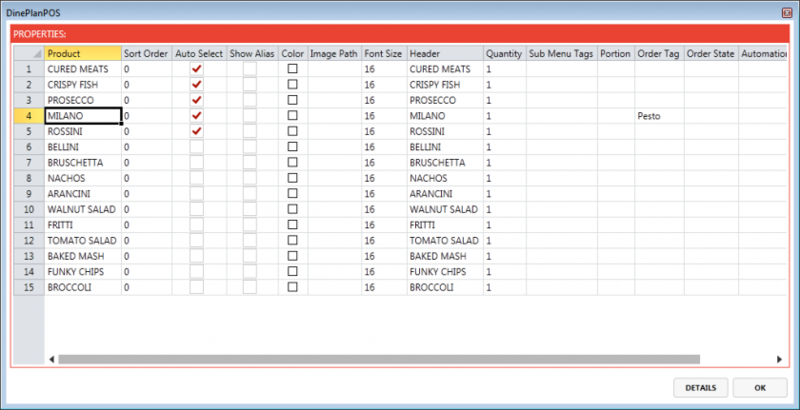 This section helps to show to how to add Modifiers for the Selected Product Group along with the Price to be added the Product while adding it. STEP 1: We’ll add another order tag group for STARTERS. STEP 2: Add some modifiers. While adding the modifiers, I have added the price to it as well. STEP 3: And we’ll map it to STARTERS product group. 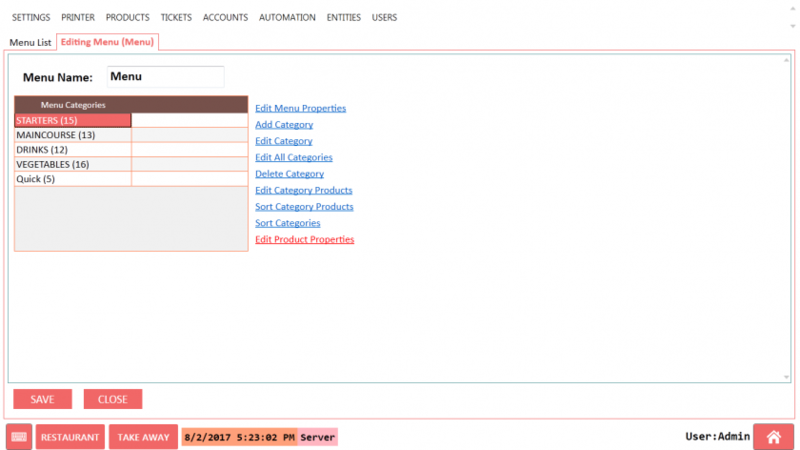 You can also map it to a specific product by choosing a product name. 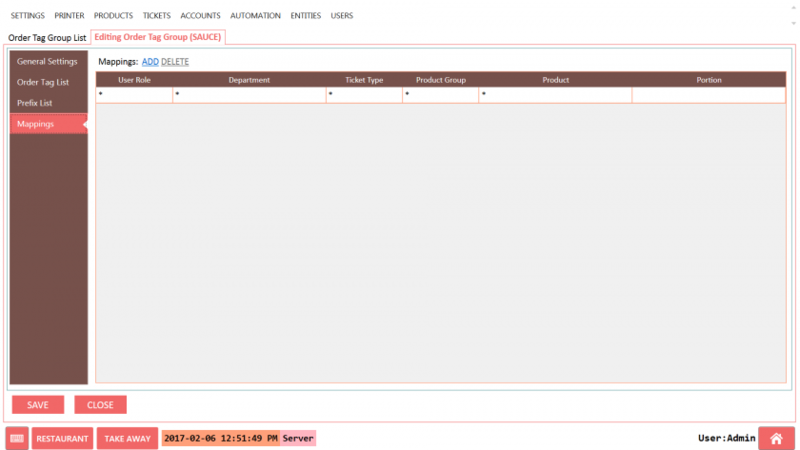 When we add STARTER (product group) and click on the order line all modifiers will appear. 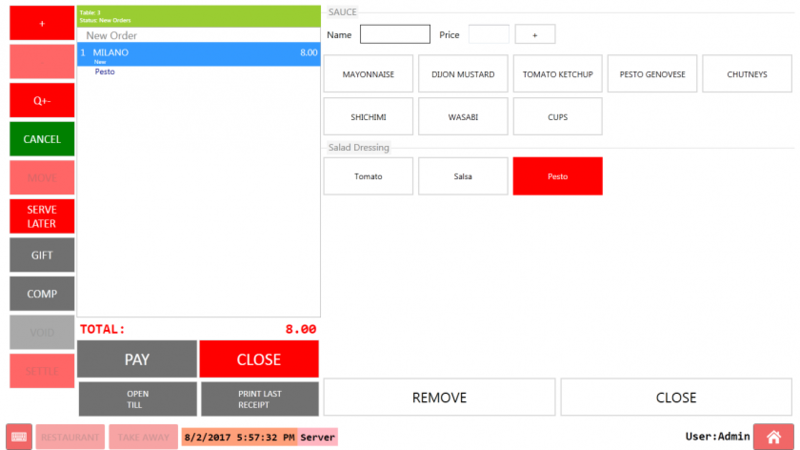 For some of the Establishments would like to add the Order Tag on the Fly. We call it as "FREE TAGGING". 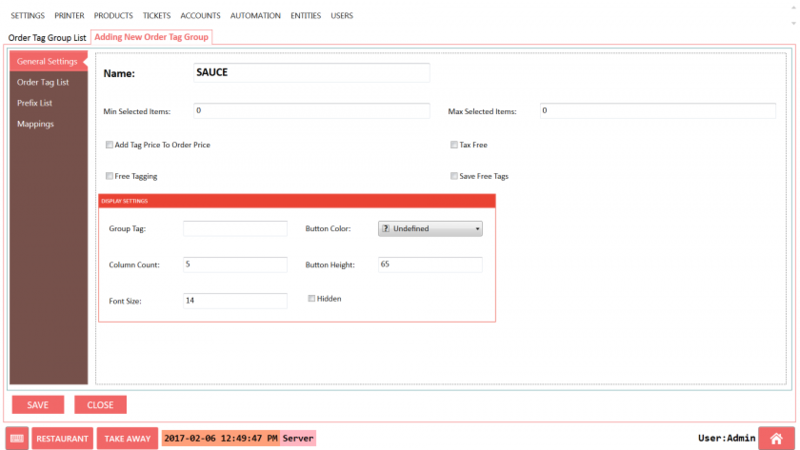 We can enable free tagging in General Settings in Order tag Group. If we restart the DinePlan after the above setting, it will be displayed as below and it will allow us to add the Modifier on the Fly and it will be reflected in the product as below. We might be in situation to add the Prices for the Order Tags. Lets do here. 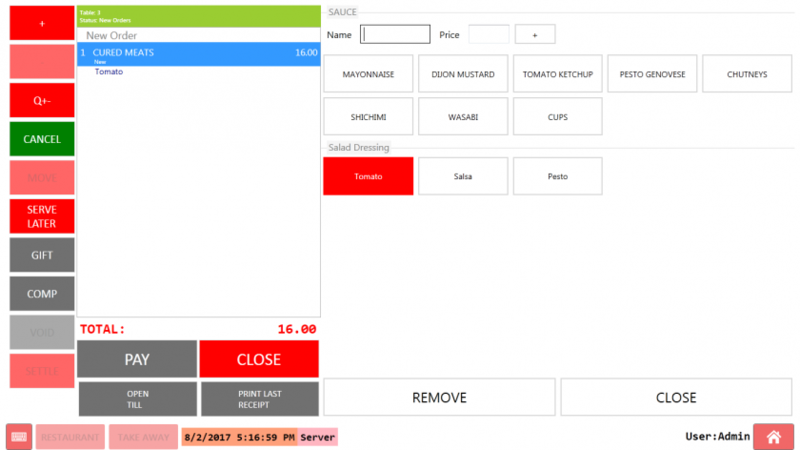 STEP 1: Create new order tag group “Salad Dressing” and switch to Mappings screen to map it to "STARTER"
STEP 3: Restart DinePlan and you will be see in the effect. These modifiers have price $1 so it will be added $1 to product price. In the above screen, the Tag price is shown Seperately but you want to add that to the Product Directly. 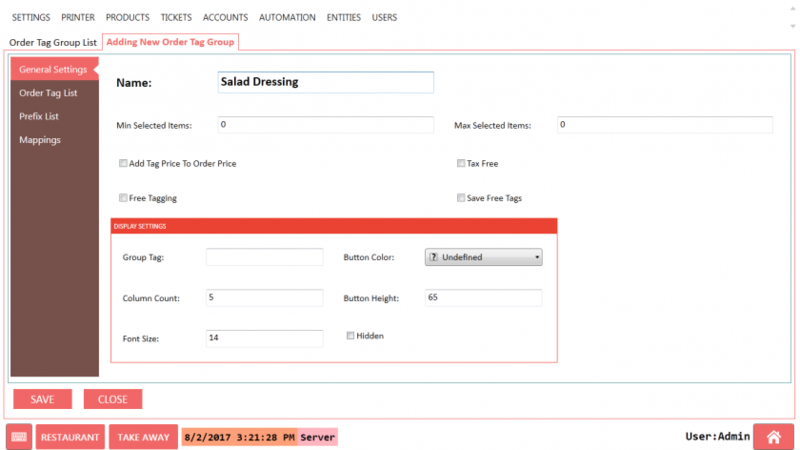 To Enable that, we have a setting in the Order Tag Group "Add Tag Price to Order Price"
As a result adding modifiers will increase order price. 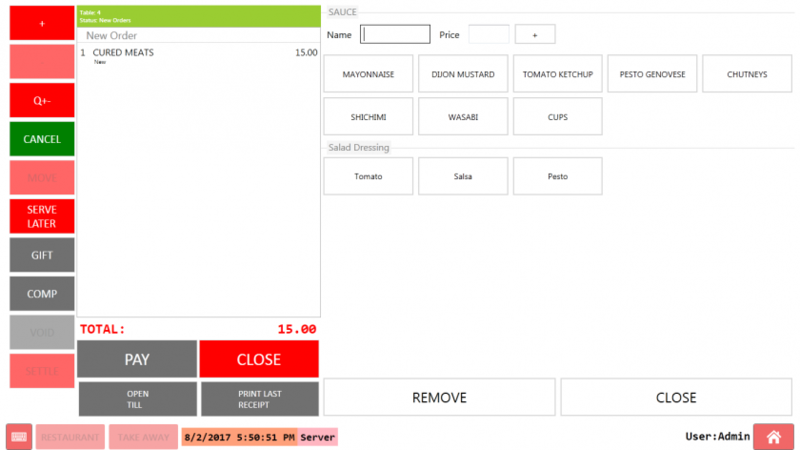 You'll notice we can select multiple dressings for salads. 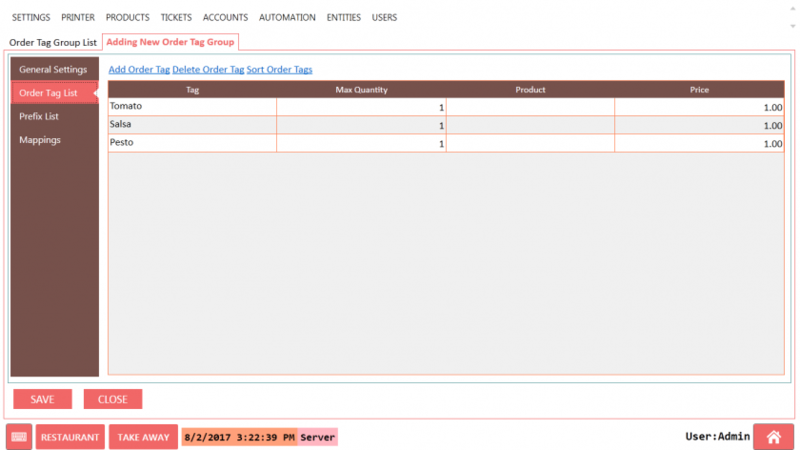 If we set Quantity to Min Selected Items, it is mandatory to select the Tags. Here is the steps for that. When we want to add the Order Tag, we have to add the product to the Ticket and click on the Product Line to select it and add the Modifier. 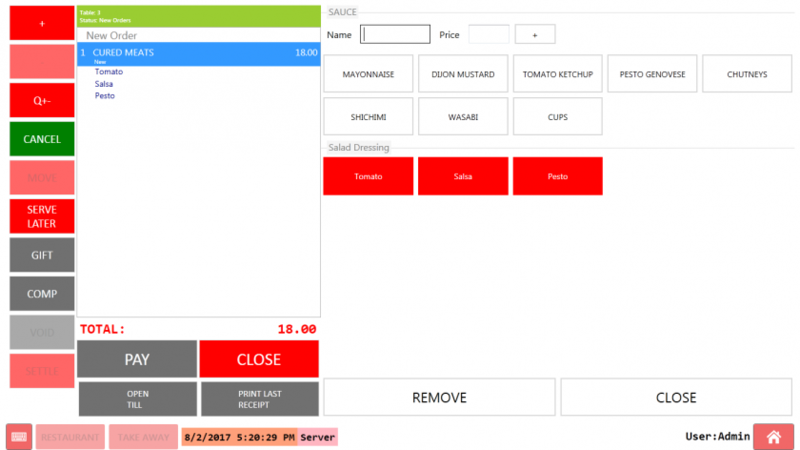 The steps are many to add the Order Tag. 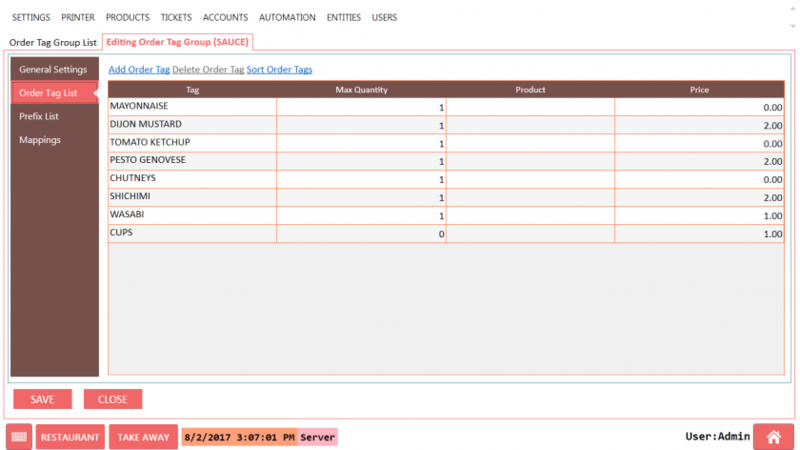 Some of the Customer wants to show the ORDER TAG Screen immediately on Clicking the Items to the Screen. Here are the steps to acheieve it. 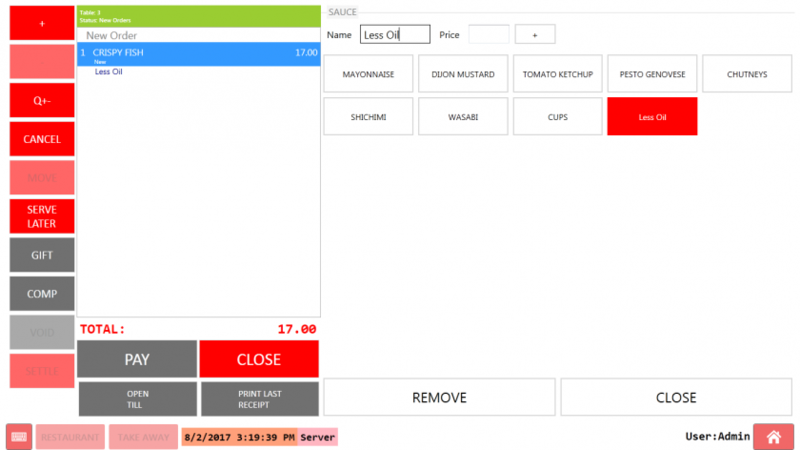 Navigate to Back Office> Products > Menu List > and double click Menu to edit menu properties. Click Salads category and click Edit Product Properties. 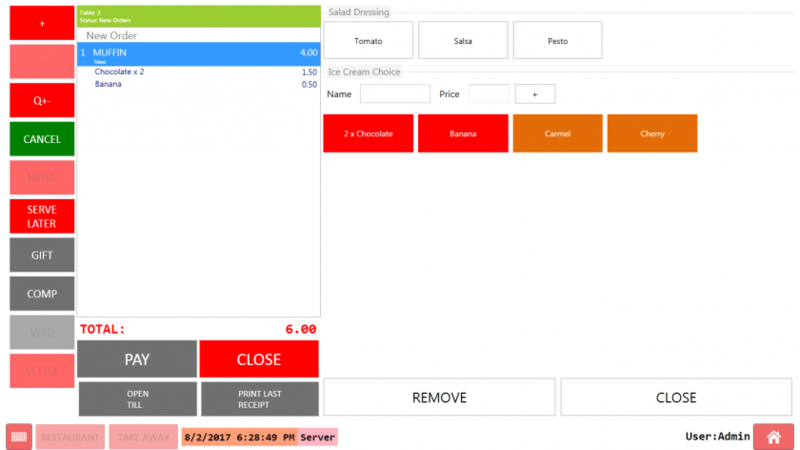 It displays a popup for displaying menu item properties. 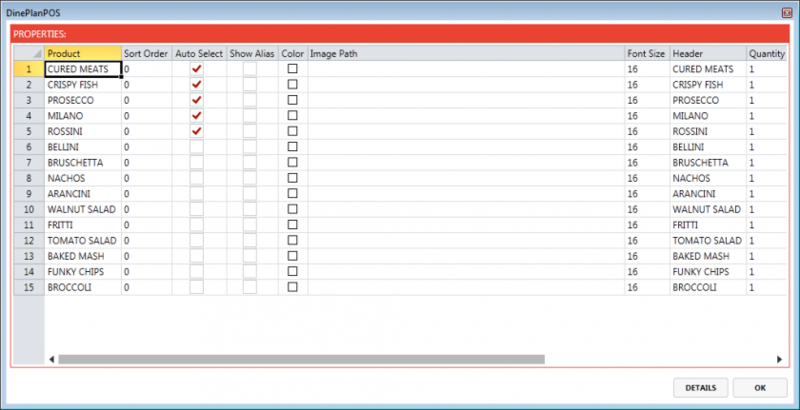 Enable Auto Select setting for the products you need to display modifiers automatically. 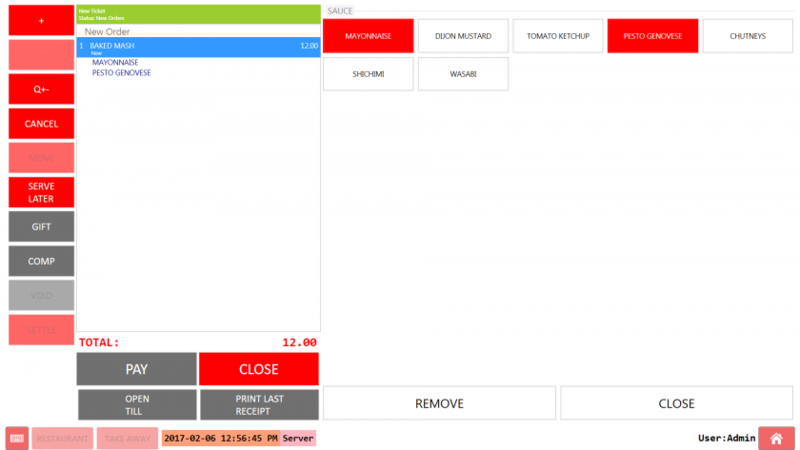 With my configuration Modifier screen will automatically display when I sell CURD MEAT, CRISPY FISH, PROSECCO or MILANO. Default modifiers are useful if you want to add modifiers as soon as you choose the products. For example we want to configure Pesto as a default modifier for Milano. We'll also change this setting on Menu Item Properties popup we saw on previous topic. I wrote Pesto modifier name here. If you need to use multiple modifiers you can type their names separated with commas. When we sell Milano, Pesto modifier will be automatically selected and since we did not enabled Auto Select setting for this item it won't display modifiers screen automatically. 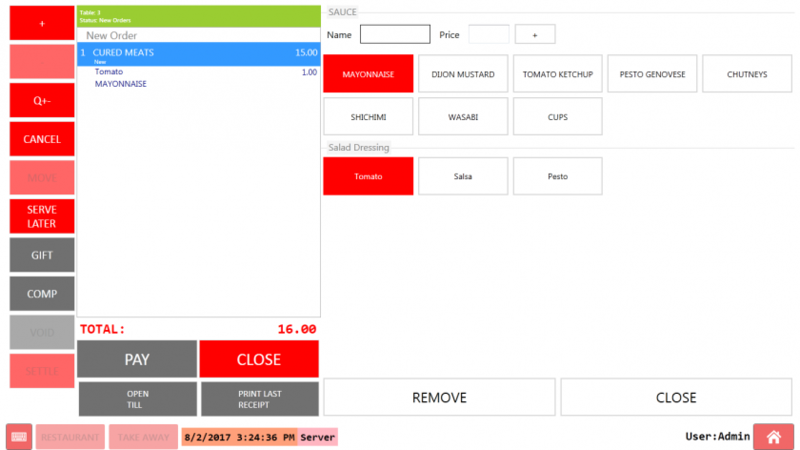 We can click on order line to display modifiers screen and change Pesto. On this sample we'll create modifiers for Muffin product for ice cream choices. 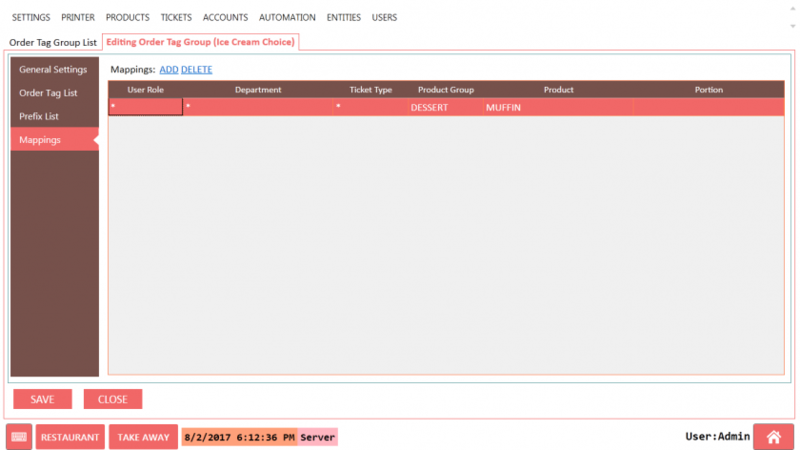 Min Selected Items will be 1 since we want to force user to select at least one ice cream. Also I've changed button color. You can change other display properties to change how buttons looks. 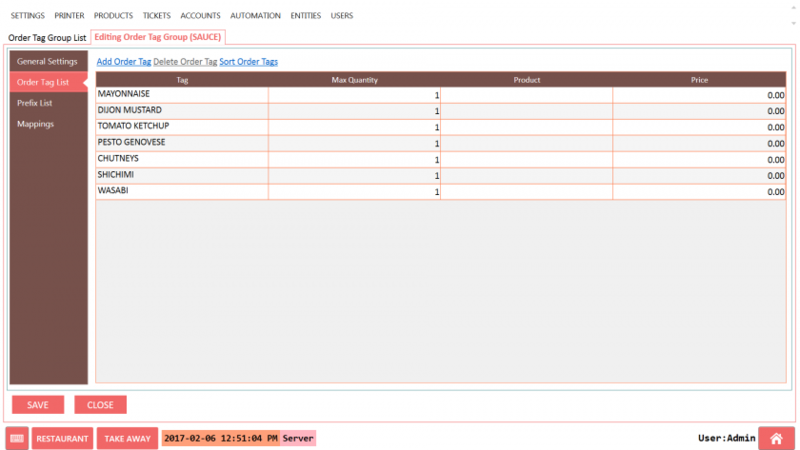 On order tag list screen I've added few modifiers. I've changed Max quantity values 0 so we can add multiple ice creams. I've also changed prices. Now we'll map it to Muffins. I'll also Enable Auto Select for Muffins. I'll create a new ticket and sell muffin. Clicking Chocolate button twice will increase modifier quantity. Price changes as we add more. You'll notice clicking modifier buttons won't toggle modifiers. If you want to remove a modifier click Remove button and click the modifier button. Imagine you are pizza restaurants. You have a lot of modifiers and all modifiers have No, Less More, Double prefixes. If you have 10 choices that makes 40 buttons. You can group modifiers by typing a group name on group. Entering a group name for Salad Dressing will display this group as a single button. Clicking on this button multiple times will toggle dressings.